My latest makeup obsession is bright pink lipstick. Candy colored pouts are having their moment this season. The best way to achieve this look is to keep the face clean and the lips bold. For a dramatic look I love wearing these bright pops of color with a winged liquid liner on the eye. 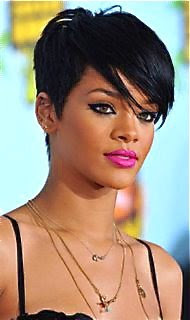 Similar to Rihanna's photo above. For a more casual look just use a little mascara and some blush. Let me know what you think of this trend!